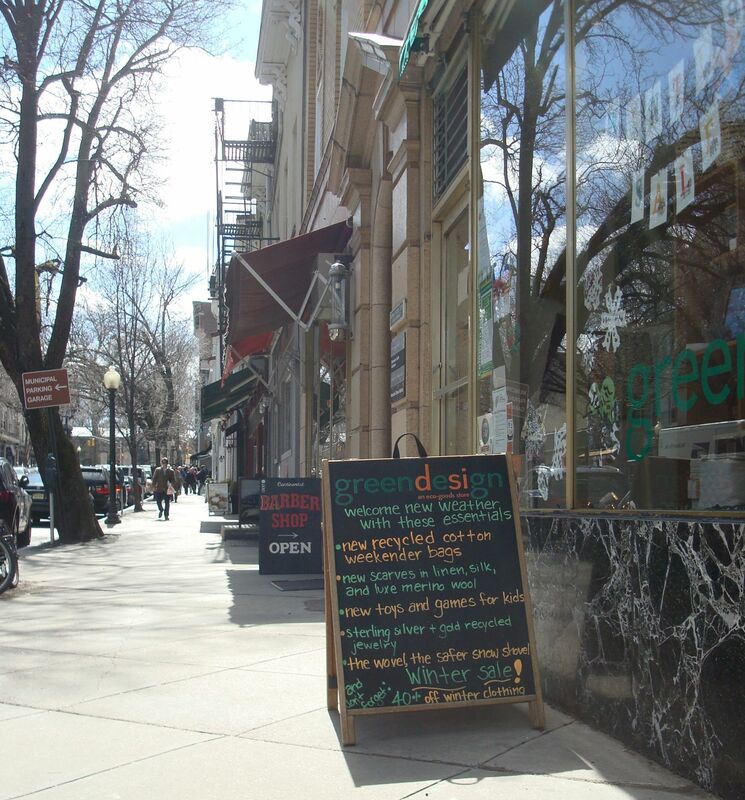 Good stuff is footsteps away in walkable downtown Princeton, but what about the rest of town? 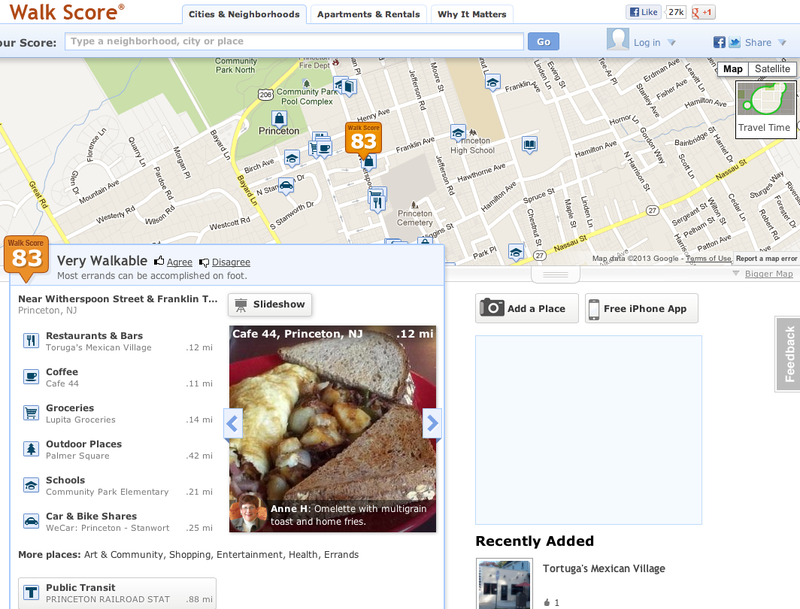 If you live in central Princeton, you will know that there’s a whole lot of good stuff nearby. Stores, bars, restaurants and parks- you have the option to do many of life’s fun and mundane tasks without even getting into a car. But what about the rest of Princeton, including the more far-flung corners of the former township? How can we judge walkability there? Walk Score measures how easy it is to live a car-lite lifestyle—not how pretty the area is for walking. 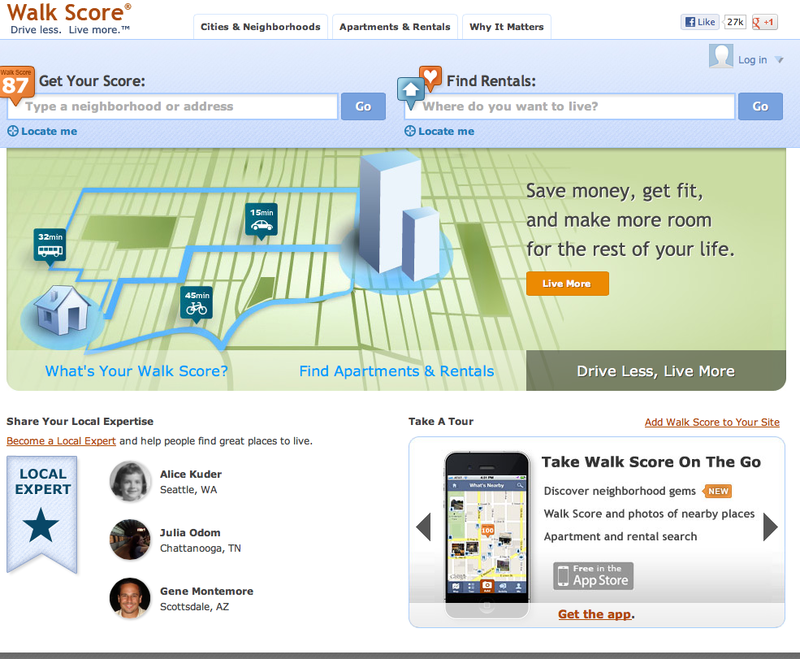 Walk Score uses a patent-pending system to measure the walkability of an address. The Walk Score algorithm awards points based on the distance to amenities in each category. Amenities within .25 miles receive maximum points and no points are awarded for amenities further than one mile. Walkability is good (as we keep saying!) because it promotes health, sustainability, economic and social vitality. WalkScore has a great guide to the benefits of walkability here. 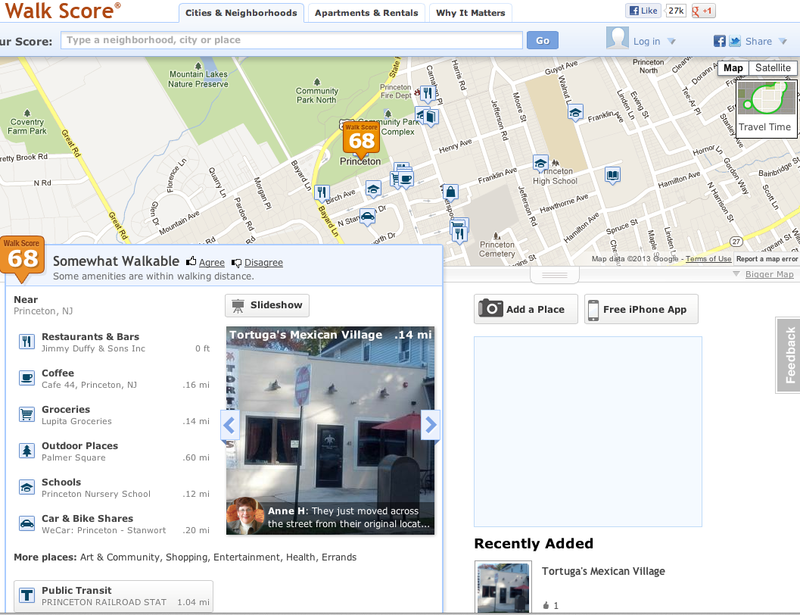 If you go to the WalkScore website (www.walkscore.com), you will find a search bar where you can type in any address to get a percentage score of how ‘walkable’ that area is. 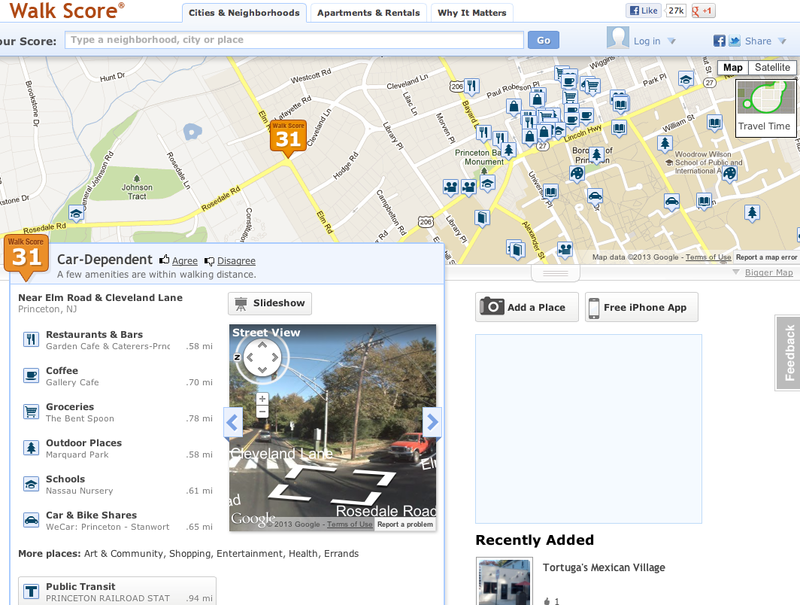 Screenshot from walkscore.com. 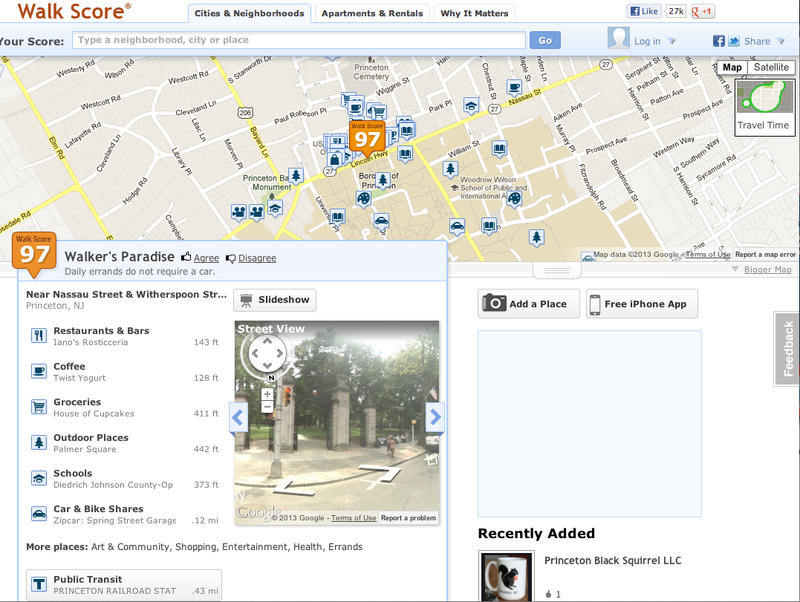 The searchbar to find WalkScore for any address is at the top left. 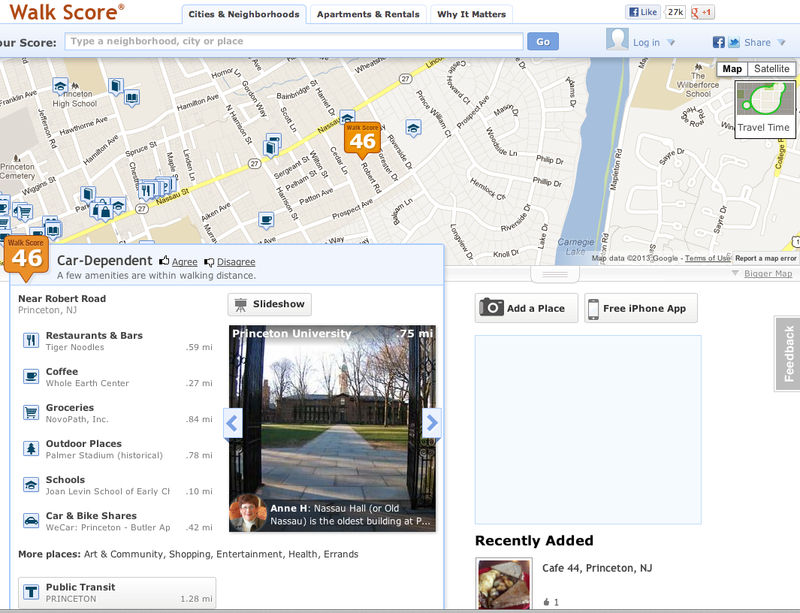 A search for ‘Princeton, NJ’ gives a ‘WalkScore’ of 68%. Click on any of these images to see a bigger version. Ah, that’s more like it! 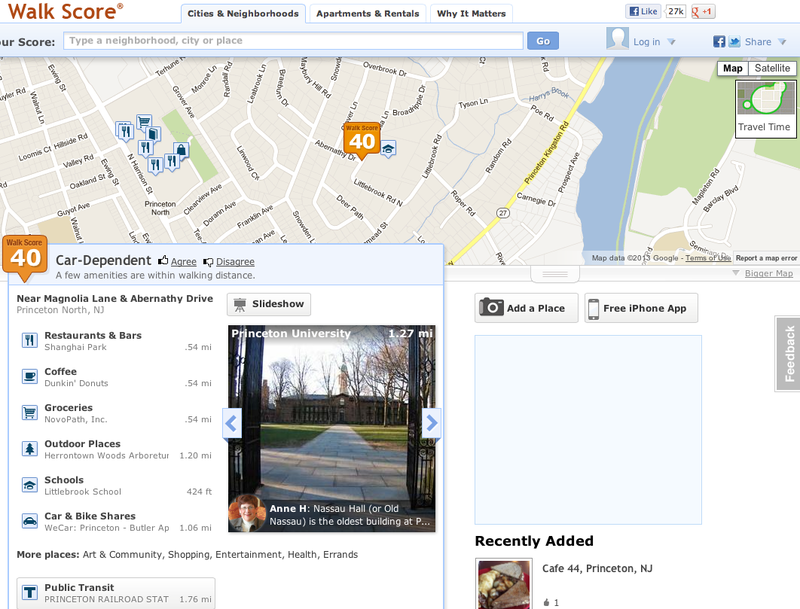 ‘Nassau St and Witherspoon, Princeton, NJ’ gives a WalkScore of 97%, which is considered a ‘Walker’s Paradise’. According to the website, this means that most daily errands do not require a car. This is true, although it does assume that you are buying your groceries at D’Angelo’s or La Mexicana. Both of these are great stores, but most people will probably want to head to McCaffrey’s, if not one of the supermarkets on Route 1, for their weekly shop. Also, ‘House of Cupcakes‘ appears to be listed as a grocery store. Cupcakes are great, but they probably don’t count as a grocery item! Again, we see some issues with the data used to calculate the WalkScore, even if the number seems right in this particular example. Littlebrook Elementary School got a glowing report this week from the New Jersey state Department of Education, but its immediate neighborhood doesn’t ace the class for walkability, with a rating of just 40% (rating: ‘car-dependent’). The stores in Princeton Shopping Center are considered a little too far away to make walking easy. The Riverside neighborhood doesn’t score much better than Littlebrook, with a WalkScore of just 46%. This seems a bit too low to us. Depending on where you are in Riverside, you can walk to the Whole Earth Center and get a lot of stuff. There is also a new restaurant opening right beside the Whole Earth Center, which will provide another walkable amenity. If you’re living in Princeton’s upscale Western Section, you probably aren’t going to worry about the price of a cab. Which is just as well, because you may have one of the worst WalkScores in town (in our example, above, the WalkScore was 31%-the worst we’ve seen yet). This is not surprising: with homes on large lots, it becomes harder to provide the density required to sustain retail and other amenities. For Western Section residents, we may have a good solution: for ‘just’ $1.3 million, you can buy a highly walkable condo in the new ‘Residences At Palmer Square‘, which we profiled last week. Currently the subject of an on/off proposal to construct apartment homes, the former Princeton hospital site scores very highly for Princeton, with a WalkScore of 83%. Impressively, the website doesn’t just consider downtown businesses, but also gives credit for local stores and restaurants such as the excellent Tortuga’s Mexican Village and Cafe 44 in the adjacent John-Witherspoon neighborhood. A WalkScore of 83% is considered by walkscore.com to be ‘Very Walkable’, which means that ‘most errands can be accomplished on foot’. The walkability of this site, and the fact that NJ Transit buses stop right in front of it, strongly supports the logic of adding denser housing here. More homes at this walkable location will increase walkable options in Princeton and reduce the number of people living in car-dependent suburbs. In conclusion: The ‘WalkScore’ is a very useful estimate of how convenient different neighborhoods or addresses are for being able to walk to stores and amenities. Although the data is not perfect, it is informative enough to provide a good indication as to how easy it is to live a ‘car-lite’ lifestyle at a particular location. As the website is completely free and works for any address in the USA, we imagine that a lot of people will find it well worth checking out. What’s your WalkScore? Do you think the website works well? Leave us a comment below, or at our Facebook page here: facebook.com/walkableprinceton. UPDATE 10/18.2017: links in this article were updated. ‘Walkscore’ is now operated by Redfin. This entry was posted in Local, Princeton, Smart Growth, Walking. Bookmark the permalink. 6 Responses to What’s Your Princeton WalkScore? ?